ATTENTION: El Barrio's Book Club meeting for February has been cancelled. Their next meeting will be on Tuesday March 9, 2010. Book Summary: The story of one boy and his journey to find himself. When it happened, Miguel was sent to Juvi. The judge gave him a year in a group home - said he had to write a journal so some counselor could try to figure out how he thinks. The judge had no idea that he actually did Miguel a favor. Ever since it happened, his mom can't even look him in the face. Any home besides his would be a better place to live. But Miguel didn't bet on meeting Dondell or Mong or any of what happened after they broke out. He only thought about Mexico and and getting to the border where he could start over. Forget his mom. Forget his brother. Forget himself. Life usually doesn't work out how you think it will, though. And most of the time, running away is the quickest path right back to what you're running from. 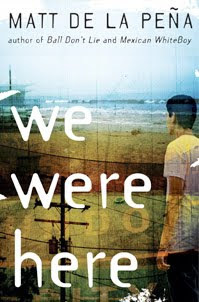 From the streets of Stockton to the beaches of Venice, all the way down to the Mexican border, We Were Here follows a journey of self-discovery by a boy who is trying to forgive himself in an unforgiving world. NOTE: The February book selection was DAUGHERS OF THE STONE by Dahlma Llanos- Figueroa.